Southern Rockies Nature Blog: Why Do We Want to Feed Birds, and Does It Help Them? Why Do We Want to Feed Birds, and Does It Help Them? 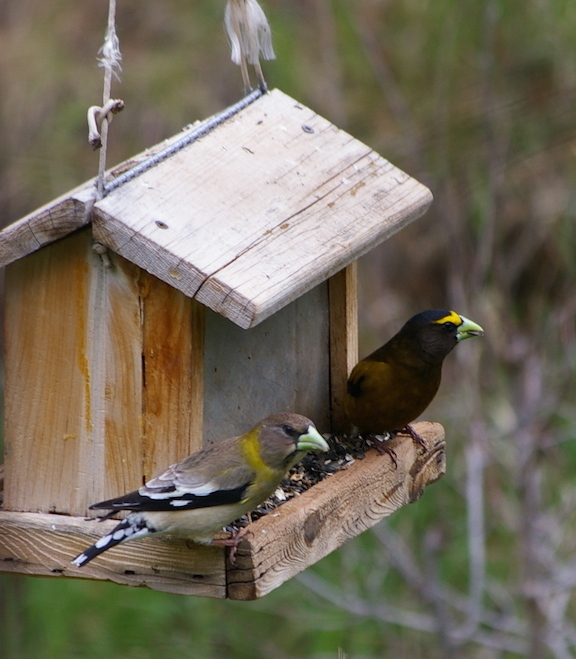 Evening grosbeaks eating black oil sunflower seeds. Australian scientist Darryl Jones answers questions about bird-feeding for Cornell University's "All About Birds." At first, it was pretty much a casual, do-it-yourself activity—tossing out food scraps or leftover grain. Bird feeding at the scale we see now didn’t really take off until the early 1980s when it became possible to go into a pet food or hardware store and buy all these specialized items for feeding wild birds. It was primarily the [cage bird industry starting to] sell to people to feed to wild birds. Why do people feel so deeply about feeding birds? Jones: That’s probably the most fascinating [question] of all—it’s so much more complex than I ever imagined. A lot of people feel that we humans have done so much damage to the environment and therefore to birds, that they want to give something back—which is a pretty serious, profound activity. Others just really want to learn about birds and feeding brings them up close. And that leads to this whole area where interacting with nature can lead to increased psychological, physical, and spiritual well-being. If that’s the case, bird feeding is one of the most intimate, immediate kinds of interaction with nature that you can have. Where Are the Dogs of Yesteryear?